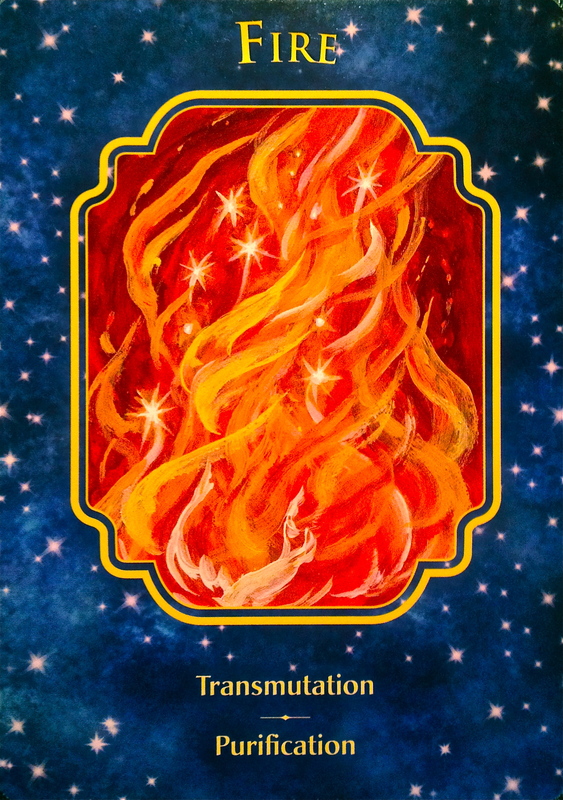 “Fire is the bringer of transmutation. It’s time to come out of your cocoon, and allow yourself to become that beautiful butterfly. Have courage. Burn off the old, allowing the new to enter. You know what needs to be done. It is time to light that inner fire (or the one under your seat!). Get busy and take steps to allow this wonderful change to occur. Have courage during this time of transition. Know that all is well. Fire also represents purification. In every transformation, a cleansing process takes place. Perhaps it is time to purify your thoughts, actions, relationships, or something else that has become unhealthy. Transmute your old habits. Interesting that we are getting this message again after only a couple of days! Interesting also that I can choose a card every day for a year, get different cards from different decks that I use, and then get two of the same cards in succession from two different decks. This is a strong message that transformation is under way in your life! This card also ties in to yesterday’s message of cleansing and purifying, body, mind and spirit. You have been holding on for too long to habits and perceptions that no longer serve you, this is the time to bless and release them. If you have been stuck in a rut, fearful of the change that your soul desires; make some changes now. You are fully supported by the Divine and cannot fail. Fear must no longer hold you back. Trust in yourself, know that your intuition is your Divine Guidance, and know that when you let go and let the Divine assist you in releasing the things that you have outgrown, better things will replace them. You need only have faith. Once you have succumbed to this purification through transmutation, your life will change in miraculous ways. Doors will open to you, people will walk into your life to assist you. Your well-being and peace of mind will improve, and you will start to see the limitless possibilities as being open to you, rather than just dreams. This is the time to show your love and trust in your angels, guides and the Divine. This is the time to know with conviction that we are all connected, to the Earth, to the Universe, to the Divine and to All That Is. This is you, not just turning a page in your life, but closing this book to start the next. Yes, Dear One, the change is that big. Welcome it with open arms.